Arthur Carmichael served a five year apprenticeship as a carpenter and joiner, and went on to be a Site Engineer on capital projects with R M Douglas Construction. In 1978 he decided to leave Douglas and start his own company, and Carmichael’s Building Services was born. The company went from strength to strength, based personal service and customer satisfaction. Carmichaels were soon working for local authorities, health services and other commercial businesses, as well as providing an excellent standard of workmanship and service for private customers. In 1988 Arthurs’ son Jason joined the company from school as an apprentice Carpenter, a position in which he enjoyed and excelled, and in 2000 Jason became a co-director of the company. Jason left school and joined the company in 1988 as an apprentice Carpenter. After completing his apprenticeship, he continued working for the company as a fully qualified Carpenter. After gaining a few years experience, Jason starting taking on supervisory responsibilities, looking after and managing minor works. Jason became a director of the company in 2000 and is now the Operations Manager. All of the Carmichaels team are local, time-served tradesmen that are fully registered in their field of expertise, so your project is in very safe hands. All gas work is - Gas Safe Registered. Jason Carmichael (Arthur's son) left school and joined the business, training as a carpenter. Carmichaels Building Service complete their first housing project and achieves NHBC accreditation. The Facilities Management arm of the company is formed. Looking after prestigious commercial property, such as St David's Shopping Centre, S.Wales. Mobile phones start to revolutionise our business and the service we provide our clients. Carmichaels has its first website!!!! Google does not exist. Carmichaels Building Services is awarded a National FMB Builder of the Year Award. 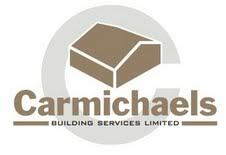 Carmichaels Developments is formed, to concentrate on the housebuilding section of the company. Carmichaels spreads its wings and wins its first maintenance contract in Staines near Heathrow. NHBC is the leading warranty and insurance provider and standards setter for UK house-building for new and newly converted homes. "..the web based database of contractors who have been rigorously vetted to ensure their health and safety standards are of the highest quality."